We can supply a range of grinding tools to work with natural stone, artificial stone, or terrazzo. 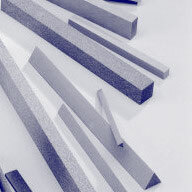 The tools enable you to grind, cut-off or glaze these materials, and are typically composed of silicon carbide (C). A black wheel denotes a course grain, while a green wheel is used for finer grinding applications. Listed below are a number of applications where both resinoid and some vitrified wheels can be supplied. When ordering, please ensure which type you require.